were suddenly so thankful that God filled a need you hadn't even been able to recognize? That is what this program has become for me. It fulfills a need I had not been aware of, and at just the right time. I am currently homeschooling one student. However, he is my third. My first two were both accepted to and attended college. #1 had to stop attending because of finance issues (somewhat of her own making, but nevertheless...) She might have been able to finish if she had had access to the information in this program at the appropriate time. Up until recently I've been thinking that my task to focus on, as his home schooling mom, is to craft and pursue his academic portfolio to his best advantage to accomplish what his goals seem to be, which will include college. So I've worked hard figuring out which courses he will take when, what Math and Science courses he should complete for high school graduation, things like that. Only recently did I become aware of another important area I need to help him prepare for, the actual experience itself, everything from thinking through potential colleges, learning about them, pursuing scholarships, visiting and applying to colleges, and so much more. My son and I are at the beginning of a journey (that will very soon become his sole journey) of figuring this "college thing" out. Around the beginning of the year I learned about College Common Sense. This program was created by a woman named Denise Ames, who works in a college financial aid office. Ms. Ames has been helping families and college students find financing for their college educations at a small Texas college for many years. Learn more about College Common Sense. 6. Pull it all Together. The student will set up a notebook, which looks different depending on the child's age. The high school student sets up a notebook divided by months, with specific assignments to be completed in each month. Younger students are encouraged to keep a life journal, where they will include especially interesting things that happen to them as the days go by. I tried to get my son to start one, but he (rightfully) pointed out that he already keeps a daily journal. I contacted Ms. Ames to see if this fills the suggestion, and she said, "I would let him keep his current notebook and eventually he'll move to another, and another, etc. Don't worry about being too strict about this. You want to go with the flow with him. Whatever he finds to be interested in, that is your new focus. His future is still so open and in flux that the greatest skill he can learn is to be flexible. " She advised that as he gets older I might want to draw him out, asking him to put down his interests and go into more depth about what he likes, why he likes it, have him research it and write down what he learns. When he gets to that point it will be a separate notebook, because that's not the type of thing he likes to put in his daily journal. Right now it is more like, "Boy Scout camping trip tomorrow. Can't wait!" I tried to involve my son in more aspects of the program, but although he sees himself as college bound, he made it clear that he is not letting go of childhood quite yet. He just wants to play and be a 13-year-old. So, I will go through this program again this year as something that I myself read, and then (like feeding him tidbits) ask him to do certain things, as if it is a school assignment, and not make things too onerous. I think in another year he will be able to begin to understand and feel the ticking clock, and see how time until graduation is precious and needs to be used wisely. But what I definitely love about this company and this program is that we're not talking about a big corporation here -- we're talking about a working woman, who has finished home schooling, who has set up a side business to help college-bound students and their parents find and acquire the available funding for college. When I write to College Common Sense, the reply comes back quickly, and it is from Denise Ames. Denise Ames = College Common Sense and vice verse. Denise Ames is experienced with all the steps necessary to successfully finance college educations, and she has skillfully woven together a program to make it easier for each family to arrive to the college years prepared. The students who takes this program seriously will have researched various potential colleges, visited colleges knowing the right questions to ask, and will have pursued scholarships knowing quickly which ones to spend time on and which ones not to pursue. The content of this program is very good. I am so very glad now to know about this program. I have learned so much from it. If you have a college-bound student, and you don't know how you will ever pay for college, or if you figure (like I do) that college is priced too high and "why should I pay full price if my student can get a merit scholarship? ", then you need to check out Going to College and Paying for it Online Video and Workbook. So who should consider Going to College and Paying for it Online Video and Workbook? This is a program suitable for parents of children in any grade. I have learned from this program that there are scholarship funds available for students as young as six years old! So families can find benefit using this program when their children are quite young, or they can ...procrastinate... and use the program when time is starting to be at a premium, and you really need to know what to do when. In my my own situation, 7th Grade is the perfect time to start this program, to go through it as the parent and make plans for my son to do it with me next year. Then I'll do it again when he is in 8th grade, easing him into many of the activities, that year, encouraging him to begin to own the project of funding his college education. Then we will repeat the program each year in high school, with the my son being responsible for implementing the program . I will be oversee his work in the earlier years with the hope that he will really understand and take responsibility for the tasks in his junior and senior years. The price of Going to College and Paying for it Online Video and Workbook is a very reasonable $25 per year. It will be well worth the investment in the long run. There are actually two ways to order. The other option is a DVD copy of the program with a workbook for $50, plus S/H. Since I plan to use this program again and again for the next five years, I hope to save up and purchase the DVD program so I will save money in the long run. 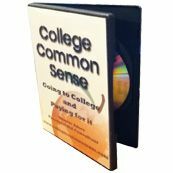 In addition to Going to College and Paying for it Online Video and Workbook, College Common Sense also offers a free monthly newsletter that I have subscribed to and am enjoying. It dove-tails nicely with the video program -- I find they work wonderfully well together, and I highly recommend you click on over there and subscribe.